After several years of writing, this blog has reached its one-thousandth post. Thank you to everyone who has been following the journey thus far! As those who have been reading the blog for some time know, my thoughts and views have been through some twists and turns along the way. "The ancient torch that was lighted for our guidance"
"Gaining fluency in the language of the myths"
"'Here it has reached the turning-point' -- the celestial map of the soul's spiritual trek"
"Whether in the body of out of the body, I cannot tell: Paul the Gnostic Opponent of Literalism"
"The bad judgment of King Midas, and what it teaches us"
"Self, the senses, and the mind"
"The incredible importance of the Inner connection to the Infinite"
"Why divinities can appear in an instant"
"There is no member of mine devoid of a god"
"Fragments of a lost whole"
"Geology, mythology, cataclysms, and the world's ancient wisdom"
"Painted Rock, the Inner Connection to the Infinite, and Two Competing Visions of Human Existence"
If I had to select one theme which runs through all of the above eight categories, or at least one theme that is on my mind lately as I reflect back on the thousand posts of this blog so far, and the topics that it has been exploring, that theme would probably be: the tension between the view that every human life is infinitely valuable and precious, and the opposite view that there is nothing cheaper than human life and that the rights of other men and women can be denied or usurped in order to advance one's own wealth or one's own group at the expense of everybody else. It should be abundantly clear from even a cursory examination of the ancient wisdom entrusted to humanity in the form of the world's myths, scriptures and sacred stories that the world's ancient wisdom teaches the first view: that human life is sacred and infinitely valuable. I will cite three examples from the ancient wisdom preserved in different cultures. 1. In the story of Jonah in the Hebrew Scriptures of what we typically refer to as the "Old Testament," for instance, the tension depicted at the end of the story involves Jonah's disregard for the value of the lives of the people of Ninevah. This previous post, entitled "The sacred fig tree, continued: Jonah and the gourd" provides evidence that the characters and episodes described in the scroll of Jonah are based upon celestial metaphor -- which means that Jonah is almost certainly not supposed to be understood as a literal and historical figure, but that the story has to do with each and every one of us instead, and with our own spiritual journey. In the final verses of the text, Jonah is nursing his anger over God's mercy towards the people of Ninevah, a people he sees as outside of his group, and God confronts Jonah and contrasts his pity for a gourd which was blasted by the wind and the sun with his disregard for the lives of six score thousand persons (Jonah 4: 9 - 11). 2. A previous post entitled "Revelation 22 and the Egyptian Book of the Dead" presents startling evidence that familiar passages from the books in what we commonly refer to as the "New Testament" of the Bible contain metaphors and sentiments nearly identical to phrases found in ancient Egyptian texts from thousands of years BC, including the Egyptian Book of the Dead. The coming was taking place in the life of every man at all times. Each man had his evolutionary solstice, his Christmas; and he would have his Easter. 546. This interpretation echoes the direct declarations found in other passages in the Egyptian Book of the Dead (also referred to in previous centuries as "The Ritual," but also known by the title "Book of Going Forth by Day") in which the speaker says, "There is no member of mine devoid of a god." Men and women are infinitely valuable because they each contain an inner connection to the infinite, and the divine realm works through them. Alvin Boyd Kuhn argues that the declarations in the Book of the Dead are not about a condition in the "afterlife," the way we are taught by conventional academia, but rather that they are describing our experience in this incarnate life, this "underworld" journey, and that thus when the text describes the identification of the individual with various gods, it is describing something that takes place in this life. Taking that ancient teaching to its logical conclusion, it means that we should respect and value everyone around us as a dwelling-place of the gods, or of the divine nature. 3. In an early blog post entitled "Plotinus and the upward way," we saw that the ancient philosopher Plotinus described the incarnation in terms of the mirror into which the child-god Dionysus was said to have been gazing when the Titans tore him to pieces (he was later reborn), or the mirror-like lake into which Narcissus was gazing when he fell in love with his own beauty. In that post, we saw that Plotinus did not teach that love of beauty in and of itself was a bad thing -- quite the contrary. However, Plotinus explicitly states that love of beauty can lead us upwards towards seeing beauty everywhere and ultimately towards discerning "the One Principle underlying all," but only if we pass beyond bewildered delight in "some, one embodied form." 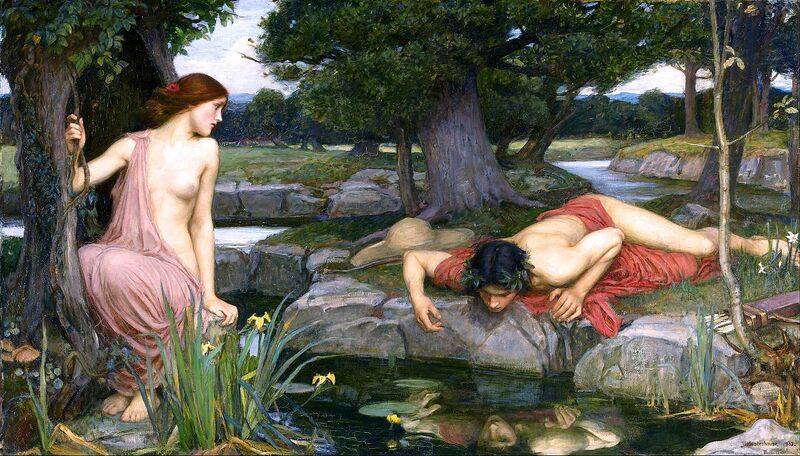 This is the opposite of what Narcissus depicted in the myths of ancient Greece. Narcissus became enamored with his own beauty -- making him unable to appreciate what Plotinus calls "the beauty everywhere" and thus Narcissus dramatizes the "downward path" that is the opposite of the "upward way" that Plotinus describes the ancient myths as teaching us. This contrast can certainly be applied to the tension between the competing visions described above: one of which sees all men and women as infinitely valuable ("seeing beauty, and in fact divinity, everywhere") and the other of which sees beauty only in one's own self or one's own circle or "people," and fails to see it in other men and women outside of that circle -- or actively denies its existence in others outside of oneself or one's clan. It should be quite clear that the ancient wisdom imparted to humanity in the form of the world's myths and scriptures teaches the infinite value of each and every man and woman. And yet it is equally clear that some groups continue to interpret them as if they supported the very opposite view. It is my hope that by writing this blog (along with the accompanying books and videos and interviews) and sharing what I've learned so far about the language that the ancient myths are speaking -- a celestial language, an esoteric language, pointing us to the reality of the Invisible Realm and the presence of the realm of the gods in the world all around us -- all of us will become increasingly inspired to listen to the myths themselves and their incredible message for us. I'm still continuing to learn, and I look forward to sharing many more discussions on these important topics. I very much hope that the study of the myths and the stars will be a blessing to you in your life, as it is for me in mine!